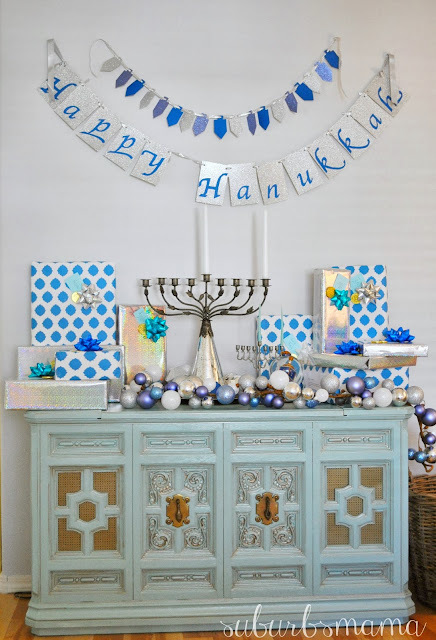 I put up our hanukkah decorations last night and the kids were so excited when they saw it all this morning! In Hebrew "hanukkah" means dedication. The name reminds us that this holiday commemorates the re-dedication of the holy Temple in Jerusalem following the Jewish victory over the Syrian-Greeks in 165 B.C.E. Once the Maccabees had regained control they returned to the Temple in Jerusalem. By this time the Temple has been defiled by using it for worship of foreign Gods and sacrificing swine. Jewish troops were determined to purify the Temple by burning ritual oil in the Temple's menorah for eight days. But they only had enough oil left for one day in the Temple. (It took 8 days to make more oil) They lit the menorah anyways and to their surprise the small amount of oil lasted for the full eight days! Every year it is customary to commemorate the miracle of the Hanukkah by lighting a hanukkah menorah. 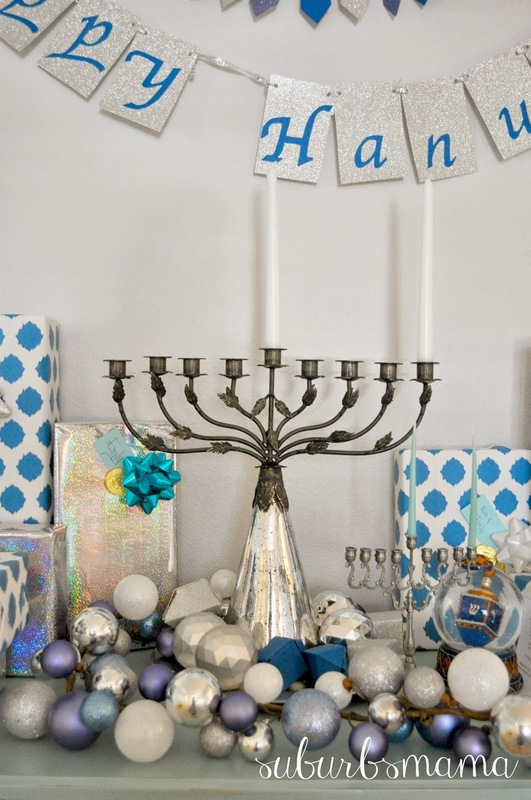 The hanukkah is lit every night for eight nights. 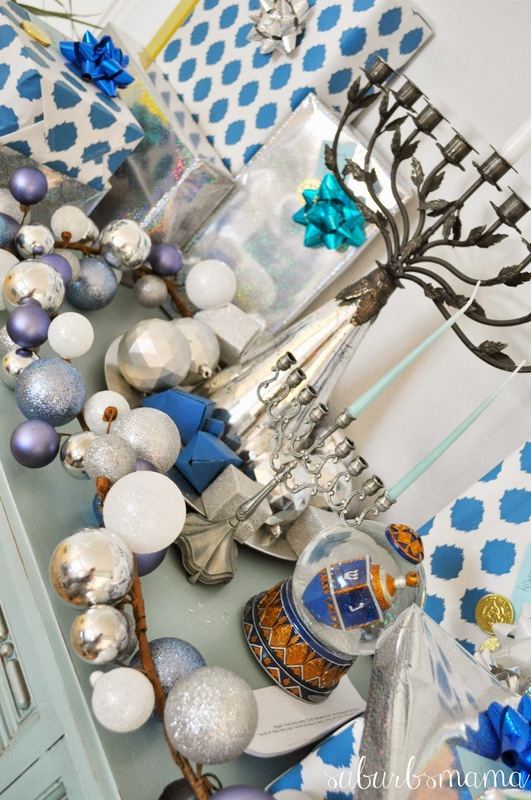 The large menorah is from pottery barn (last year) but they have it again this year and it is on sale now. 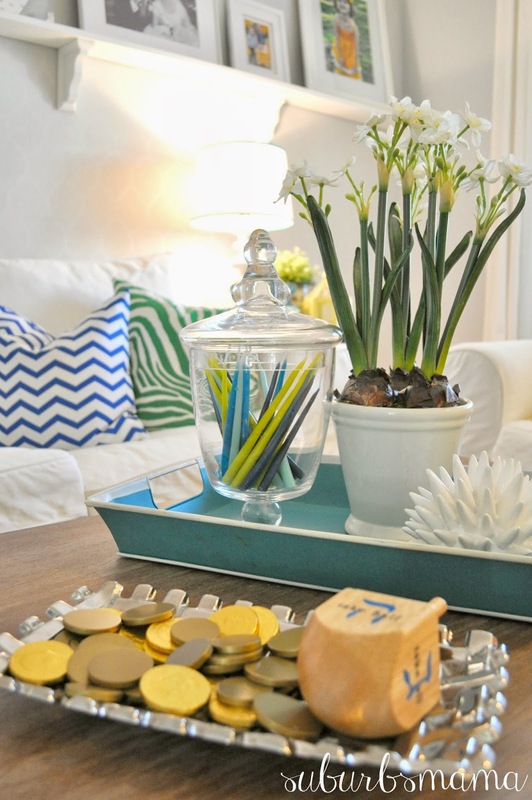 My kids love to play dreidel! The dreidel is also from pottery barn (last year) but they have it again this year on sale! I love that we are starting new traditions with our little family. I hope to keep it up each year, so one day they can keep these traditions with their families. So, Rita, I'm curious to know, are you a Jew who also worships Jesus as Messiah? I hope you don't mind me asking you. That was a great description of Hannukkah. And I loved your decorating. Do you also celebrate Christmas? While I'm familiar with some of the Jewish celebrations, I'm sure that you could educate me on Shabbat. It would be fascinating, as my husband's grandfather was a Russian Jew who came to believe in Jesus. Rita, love your blog. I'm probably your oldest reader at 64 ! I'm familiar with the Jewish faith and traditions. We are asked often if we are Jewish because we have a Mezuzah on our door post. We are Catholic. We follow some of the Jewish traditions. Would you mind sharing more on your faith. If you feel that is private I will understand. You are an amazing young woman with great taste. so so gorgeous! LOVE the ornament garland! Stunning! 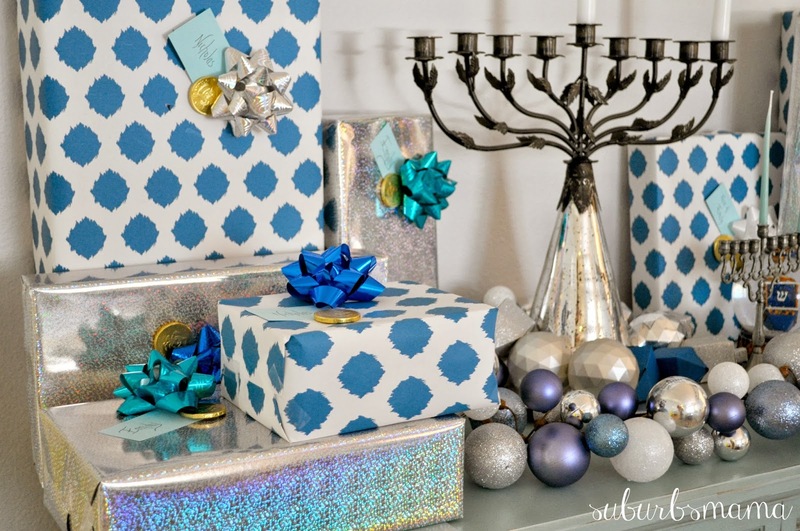 I especially love the Ikat dot wrapping paper but everything is just perfect. Very pretty and festive! 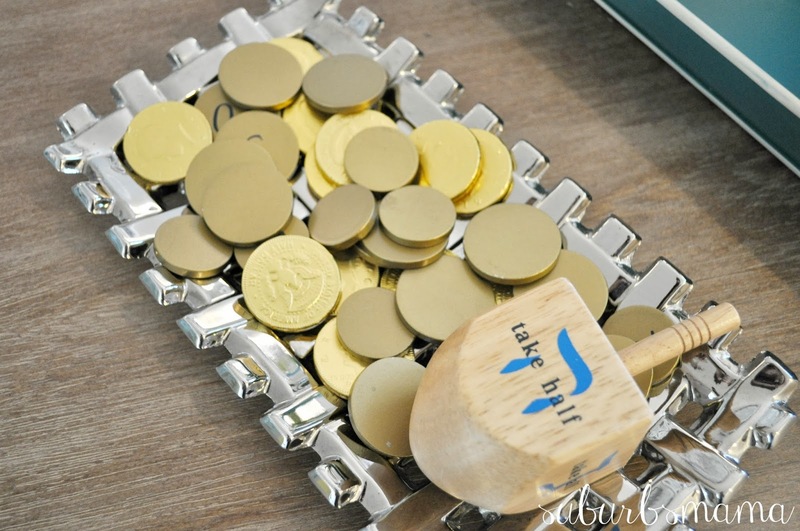 I love that menorah! It's gorgeous! 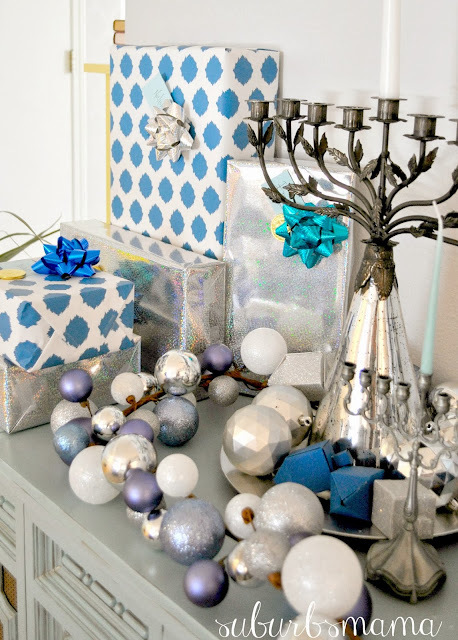 I love this display, especially with the wrapping paper as part of the décor-I never remember to do that. I read your post about your religion today, and I have to say, I have never heard of someone not being jewish but still celebrating and incorporating Judaism in their lives. like your commenter who said they use a mezuzah but are not jewish. I've always been jewish, but if I wasn't, I probably wouldn't incorporate another religion into my own. I guess it comes down to individual beliefs, and to each his own. I support what you do, and what you believe even though I may question some things. 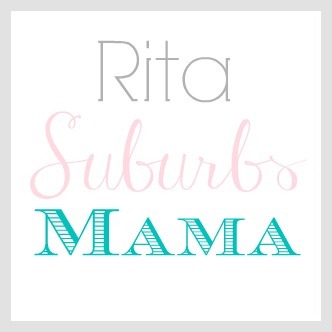 Rita, we love your blog. 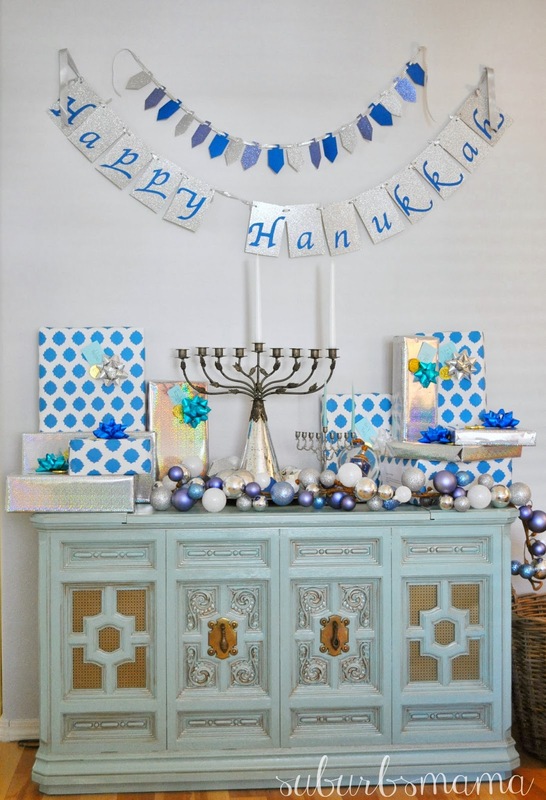 The Hanukkah party decors are just wonderful. Thanks for sharing. We've featured your post on BeBetsy Brag About It No. 32 - so check it out!